The Great Basin Desert is situated between the Sierra Nevada and Wasatch Ranges in the Western United States. Mesquite sand dune environs in the Great Basin Desert. At 200,000 square miles, the Great Basin Desert is the largest desert in the United States. It occupies most of Nevada, as well as parts of Utah, Oregon, Idaho, and California. On its eastern boundary, the Great Basin Desert borders Utah’s Wasatch Mountains. On the west, it borders the Sierra Nevada and Cascade Mountains. The Great Basin Desert is one of four major deserts in the US, the others being the Mohave, Chihuahan, and Sonoran deserts. The difference is that, unlike others that are conventionally hot deserts, the Great Basin Desert is a cold desert. The annual snow precipitation at the desert is less than 10 inches of snow, according to the US National Park Service (NPS). For thousands of years, the Great Basin Desert was home to Native American Indians. In more recent times, farmers, ranchers, Mormons, and sheep herders have also occupied parts of its expanses. Rock art has been found in the Upper Pictograph Cave in the Great Basin Desert that archaeologists believe was painted by Fremont Indians who lived in the Snake Valley from between 1000 and 1300 A.D. They painted animal and human figures upon them. The Great Basin also has many old mining camps, such as the ones near where miner and rancher Absalom Lehman, the discoverer of the Lehman Caves, lived. According to the Great Basin Heritage, livestock were introduced into the Snake Valley by Howard Egan in 1849. The Great Basin is dotted with ancient sites that serve as evidence of the existence of Paleo-Indians and their lifestyles. These peoples once hunted such large game as mammoths, bison, camelid species, and others upon these grounds. There also are ancient milling tools dating back to between 9,000 B.C and 400 A.D. that have been discovered in the Great Basin area. The Great Basin Desert brings revenue through tourism by drawing in around 90,000 tourists annually. 50,000 of those visit the Lehman’s Caves, according to the NPS. Hiking on trails, fishing, horseback riding, taking scenic drives, camping, stargazing in the dark, skiing, and snowshoeing are just some of the outdoor activities visitors to the desert can engage in. The Great Basin Desert also shelters endangered plant species like the greasewood, as well as the endemic Kangaroo mouse. The desert also has Goshute Mountains where hawk migrations occur. In the six subalpine lakes of the Great Basin Desert, there are endemic brine shrimp species living there. These lakes' shores and shallows are vibrant with avian life as well, as millions of migratory birds depend on them for food and sanctuary. Over 800 plant species are to be found in the cold, temperate, and mountainous Great Basin Desert environs. Sagebrush, salt-bush, rabbit-brush, black-brush, hop-sage, cacti, horse-brush, and winter-fat are among the species of flora adapted to survive in this harsh, cold desert. There also are scrub species that are aromatic, non-sprouting, and that branch out vibrantly, and many are softwoods with evergreen leaves. 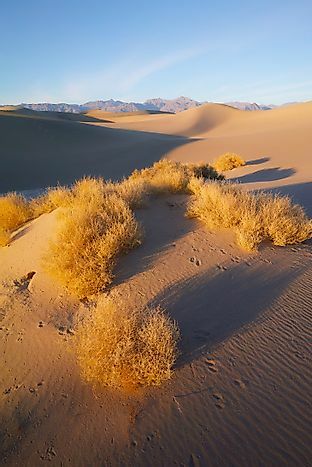 As there are parts of the desert where soils are especially salty, salt-brush and iodine-brush have leaves that excrete their namesake salts to ensure that they survive. This habitat, according to the NPS, has 70 percent of all North American mammal species within its bounds. These include Water shrews, Yellow-Bellied marmots, beavers, Sagebrush voles, porcupines, Jack rabbits, Bighorn sheep, Pack-rats, elk, coyotes, bobcats, badgers, Pygmy rabbits, and the Ring-tail cat. The ecological balance in the Great Basin Desert has been interrupted by Bromus tectorum, an invasive grass species introduced into the region in the 1800s and 1900s from Eurasia and Mediterranean regions. This grass has taken over the landscape in many otherwise sagebrush-growing segments of the desert, and has also replaced the role of many of the indigenous grass species. At the end of its growing cycle, Bromus tectorum, as well as many other arid grasses, leaves behind highly flammable dry herbage, increasing the chances of wildfire incidents in the region. World Wildlife Fund also reports that only 10 percent of intact natural habitats remain uninterrupted in the Great Basin Desert, due in large to grazing and browsing activities there by commercially raised livestock. The irrigation of alfalfa and other cultivated crops has also increased salinity levels in the desert's soils. Pollution from mining and rapid urban expansion in some areas are also threats to the Great Basin Desert's biodiversity.